First the food — I have eaten at the Rusty Scupper before. The ambiance supplants the just ok food. Why return — convenient for friends in the Baltimore area. The menu — if they can make what’s printed, seems pretty good and so is the wine list. But the food is just not that well prepared or presented for the price. However, if done well, quality seafood at a nice seafood restaurant has a price. Anyway, I ordered the Cioppino. I have had it there before and it was ok. I have even made it myself as a holiday meal — very expensive to make if prepared correctly with all the seafood ingredients. This time, Instead of a large cast pot as before, they brought me a small flat bowl of tomato soup with a couple of claims, two shrimp and loaded with pepperoni or some thinly sliced sausage. It even had one a single one inch chunk of carrot and the same in potato—I think they threw this together with what they could find because the kitchen did not know what they were doing.I know of know of no Cioppino recipe that calls for sausage? I knew there was a problem when the waitress came to the table basically apologizing for the time our meal was taking to prepare. My date only ordered sautéed veggies and the restaurant was not busy for a Tuesday evening. I did not complain as I was on a date — I don’t usually write reviews, but this was horrible. 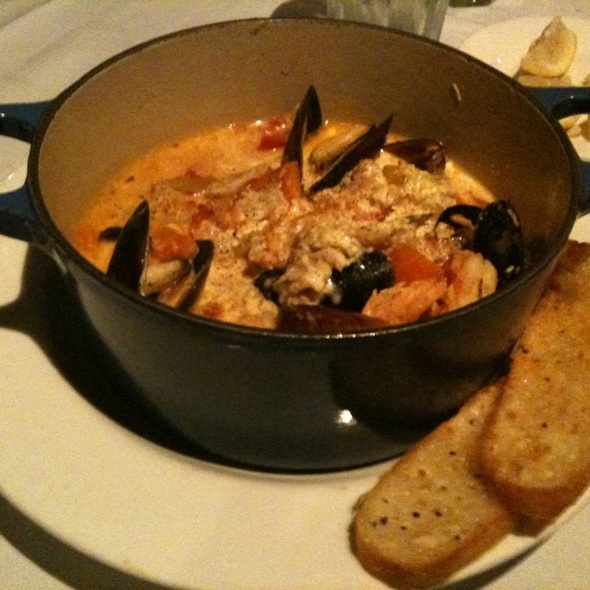 I did tell our waitress that it was like no Cioppino I had ever had and that I have never had it with sausage. Again it was really bad. We enjoyed our brunch very much. However, it came as a surprise to us to find that we were seated on the upstairs level. Fortunately it was no problem for us, but it might well be for some people who are unable to go up two flights of stairs and were not warned of this in advance! The disadvantage was having to go downstairs to get our food, although the advantage was that it was much quieter up there. The Rusty SCUPPER will always be my favorite place to eat in Baltimore. Primarily because of the ambiance, I enjoy taking friends there. I also appreciate the fact that the food is still excellently prepared. The service is good and the staff are very friendly.